Thaddeus Young (21) led the Pacers with 16 points in his first preseason action. 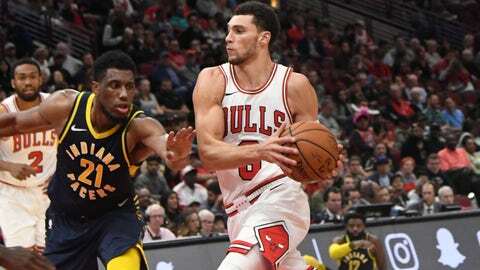 Thaddeus Young, who missed Indiana’s first three preseason games because of a foot injury, scored 16 points as the Pacers lost to the Bulls 104-89 in their fourth and final preseason game. Young made 8 of 12 shots from the field and grabbed 10 rebounds in 29 minutes. Pacers rookie Aaron Holiday hit three 3-pointers and finished with 15 points. Veteran Domantas Sabonis had 13 points and nine rebounds in 20 minutes and Victor Oladipo scored 12 points with seven turnovers. Chicago’s Bobby Portis made his first start of the preseason, scoring 20 points on 8-of-11 shooting, including three 3-pointers. Jabari Parker, who signed a two-year, $40 million deal with Chicago in July, had 11 points in 26 minutes off the bench. Indiana’s preseason ended at 2-2. The Pacers open the regular season at home against Memphis on Oct. 17.